The Loksatta Party today refuted the charge that it has colluded with the TDP in criticising the YSRCP election manifesto. Responding to YSRCP leader Gattu Ramachandra Rao’s charge, State Loksatta Party President Katari Srinivasa Rao in a media statement pointed out that the Loksatta has taken exception to irresponsible and wild promises being made not merely by the YSRCP but also by the TDP and TRS. Even as he Loksatta is fighting for ways and means to meet the revenue deficits the two emerging States are about to face, some parties are seeking to aggravate the crisis by making reckless promises like loan waivers. 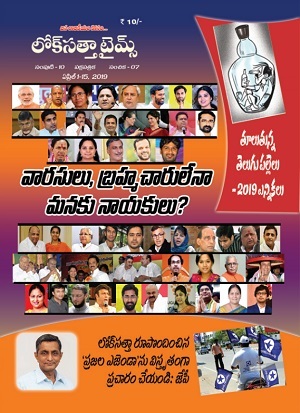 The Loksatta has criticised the YSRCP for its costly promises including payment of money for enrolment of children in schools when the problem of the day is quality of education and not enrolment. The move amounts to bribing voters. It has taken exception to the YSRCP proposal to make judges part of administration in total violation of the Constitution. 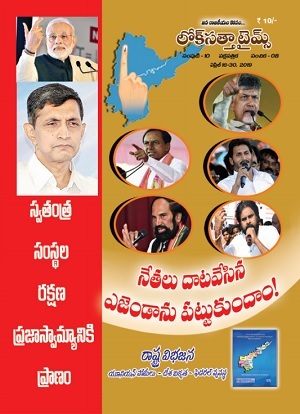 Loksatta party national President Dr. Jayaprakash Narayan merely drew attention to the irresponsible promises in the YSRCP manifesto but never said he did not understand it. Instead of taking Loksatta’s criticism in the right spirit and correcting its course, the YSRCP has exposed its bankrupt thinking by indulging in counter-attacks, Katari said. In reply to the charge that the Loksatta has never sought a probe into charges of corruption against TDP President N. Chandrababu Naidu, Katari recalled that the Loksatta on October 16, 2007 had sought constitution of a special court to go into corruption allegations exchanged by the then Chief Minister Dr. Y. S. Rajasekhara Reddy and Mr. Chandrababu Naidu in the Assembly. Dr. JP reiterated the demand on April 1, 2008 when the Assembly discussed corruption among elected representatives. In fact, he drafted a Bill to amend the Prevention of Corruption Act providing for swift and sure punishment including confiscation of properties of the corrupt and circulated it among Government and Opposition leaders on June 10, 2009. But all the parties shied away from following it up. Katari said that the Loksatta in its 18-year history as a movement and party has had the distinction of working openly with all parties and forces interested in cleansing politics, unlike the YSRCP which enters into secret nocturnal deals. He asked the YSRCP to respond to criticism on policy issues with dignity and decorum and not indulge in cheap counter attacks.